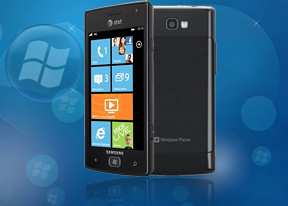 One of the main peculiarities of the Windows Phone OS is that it doesn’t allow any customizations from the manufacturers of handsets – a feature which Android is well known about. Add to this the strict hardware requirements for the devices and there is very little wiggle room left for innovation. The homescreen is a square grid of Live tiles. Live tiles fit the broad concept of “widget” but, unlike most widgets out there, they are very uniform with clear labels that indicate what each one of them does. They also show some quick info (e.g. number of messages, the date) but they are also the Windows Phone 7.5 equivalent of homescreen shortcuts. The color theme of the interface is customizable – the background can be dark or light and the color of the elements (e.g. the fill color of Live tiles) can be any one from a long list of available options. The main menu is a traditional list – this is where all the hubs and installed apps are listed in alphabetical order. A press and hold reveals a context menu, which lets you “pin” items to the homescreen (that is put their Live tile there) along with uninstall and also rate and review the app (if it’s an installed app). Multitasking has finally made its way to the Windows Phone OS with the Mango update. To switch between apps you press and hold the Back key (that's right, the Back key, not the Windows key). The app switcher itself looks similar to that of Symbian or WebOS: thumbnail snapshots of the apps, ordered chronologically left to right. Eventually, as you open more apps, the old ones start to drop out of the list. Once an app is gone, you have to launch it again the old fashioned way, which has the drawback of starting it over from the beginning. Multitasking can be disabled from the settings to save battery. There you'll also find a list of all installed apps that support multitasking. Windows Phone 7.5 can be controlled through voice only - you can dictate a text, have the phone read out the reply, you can initiate searches and so on. Other OSes are doing it too (•cough•Android•cough•) but voice commands are a big part of iOS (and a loudly touted one at that), so WP7.5 can brag about it too.